Kristi R. Riley | Fafinski Mark & Johnson, P.A. Kristi Riley practices in FMJ’s Real Estate group. She represents developers, individuals and entities in matters related to all aspects of land acquisition, development, construction and financing, including drafting, reviewing, and negotiating purchase and sale agreements, options, easements, restrictive covenants, commercial leases, operating easement agreements, development agreements, and financing documentation. She also advises clients regarding governmental approvals, reviews and advises regarding title and survey issues, drafts and reviews conveyancing documentation, and attends closings. 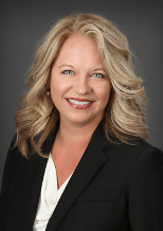 Kristi has extensive experience in retail development and leasing, as well as office and industrial leasing. Kristi has significant experience in resolving cell tower leasing issues. She has also practiced in the areas of corporate law, employment and labor law, banking and finance, product licensing, and dispute resolution. Kristi, her husband Chris and their daughter Chloe live in Andover. She is a self-proclaimed sommelier who enjoys reading, traveling, and spending time with family.